We all know about the .COM’s and .COM.AU’s of the world but did you know there’s over 1000 top-level domains on offer? Many are industry specific, others hobby related and some are just down-right bizarre. Here’s a list of just 12 that you might not know about, all of which you can register through VentraIP Australia. The Irish are best known for their Guinness and being lucky, but they also have their own domain name to add to their repertoire, so give up your hunt for that elusive Four Leaf Clover and find your .IRISH domain name. If you’re anything like us here at VentraIP Australia, you go through gallons of the stuff. Now’s the time to raise your mugs and say cheers to your .COFFEE domain name. A four-tiered cake and choreographed dance moves are nice but everyone knows your wedding needs it’s own website to be a real hit and what better way to showcase it than with a .WEDDING domain name. Do you hear that? We do too. That’s the buzz surrounding your new .BUZZ domain name. Now, only if bees knew how to use a computer, this domain would be the world’s next big thing. Forget about Cryptocurrency, cash is still king and no other domain name says “Show Me The Money” like a .CASH domain. Make it rain and register your .CASH domain name today. Let your inner party animal out with a .PARTY domain name. You’re one step away from immortalising your dance moves and party tricks with a domain name that people want to scream and shout about. Surprise, surprise! The internet’s favourite three letter word now has it’s own domain name. Next time someone is rolling on the floor in stitches, make sure it was because they visited your .LOL website. It’s time to stop horsing around and finally get that domain name for that special four legged animal in your life. Jump in the saddle and ride off into the sunset with your .HORSE domain name today. Breathe in, breathe out. This domain name is perfect for all those centred people in the world who have no problem contorting their bodies in places we didn’t know were possible. May you be at peace with your .YOGA domain name. Who doesn’t love pizza. It can be enjoyed hot, cold or even the next day. We’ll leave the pineapple-on-pizza debate out of this, but what isn’t up for debate is your need for a .PIZZA domain name. It’s time to win big and go all in on a .POKER domain name. 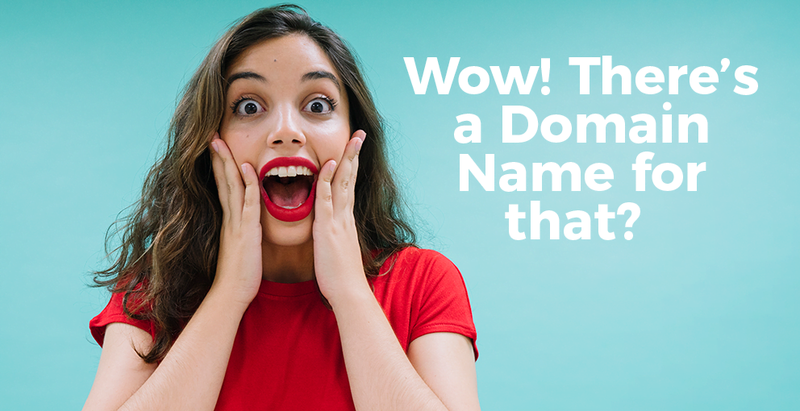 No poker face is required here, you can shout on the rooftops that you have finally found the perfect domain name. The internet is full of fails, but registering a .FAIL domain won’t be one of them. What better domain name could there be to show politician’s cringe-worthy moments and dogs being stumped looking at themselves in the mirror.